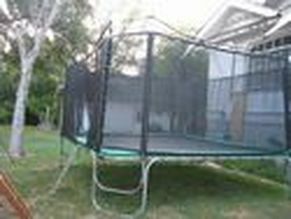 The #1 Round Trampoline in America is the Skywalker 15' Round Trampoline & Enclosure. I'll begin with a product I don't even carry, so hopefully you can see this list is unbiased. 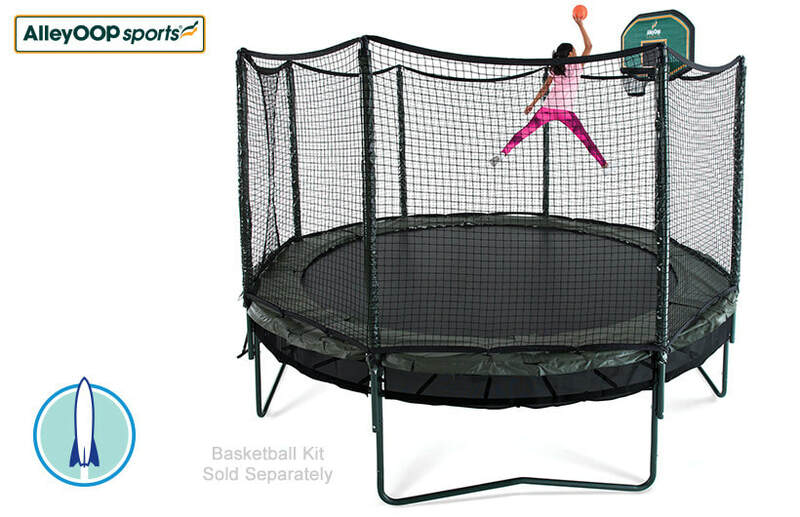 I've provided an Amazon Link to purchase the trampoline. The reason behind the popularity of this unit, is mainly the cost. This is a highly mass produced unit. I would rate it above most all department store brands. The assembly is not as time consuming as many other brands. 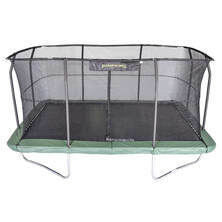 It is not super bouncy with the smaller springs that are used, and unfortunately the net only goes to the edge of the jumping surface, rendering the padding outside of the net useless other than the doorway entry. This is about a 13' jumping surface. Skywalker makes a 14' round and a 12' round as well. Their quality is less than their popular 15' model. 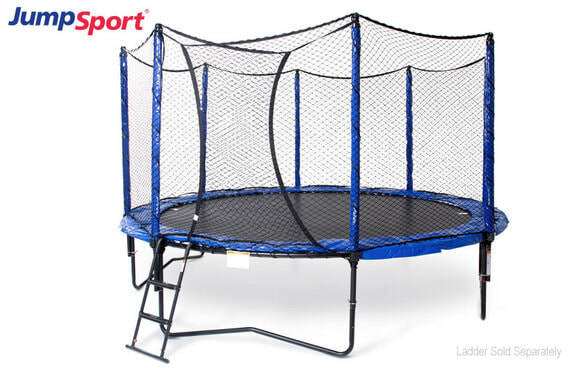 This is the most popular trampoline I carry, and it's not in the cheap or the high end category. It finds itself right in the middle. This trampoline comes with 3 unique features. The enclosure poles have sleeves to protect the foam, the frame has holes punched in top and bottom of it to make it more bouncy, and it comes with a shoe bag as well. JumpKing makes an identical unit in a 14' shape as well. Once you get into their 12' size or lower, the quality goes down. The 9'x15' Rectangle unit is great for narrow yards, or those looking to get the least expensive rectangle. Skywalker also makes an 8'x14', but the 9'x15' is more popular in my findings. This unit will come in 3 large heavy boxes, and a lot of times these boxes receive damage in shipment, oftentimes leading to torn boxes, and potentially lost pieces. The assembly has a lot of nuts and bolts and drive most people nuts. Once completed in the presence of kids, I've gathered them complaining about the bounce being less than expected. Also, once again, the net only goes to the edge of the frame, so this is really about a 7'x12' jumping space, while making the padding useless other than the doorway entry. This is actually a newer trampoline released in 2017. I anticipate this to be the "hot item" of the year as it's a mid level affordable rectangular trampoline. The padding is outside of the net on this unit, but it is a bouncy rectangle. The mat size is comparable to most brand's 10'x17' size (mat size 7'x14', which is regulation / competition size). Adequate springs make for a good bounce, and the netting is held up by 8 poles. Replacement parts are inexpensive through JumpKing. 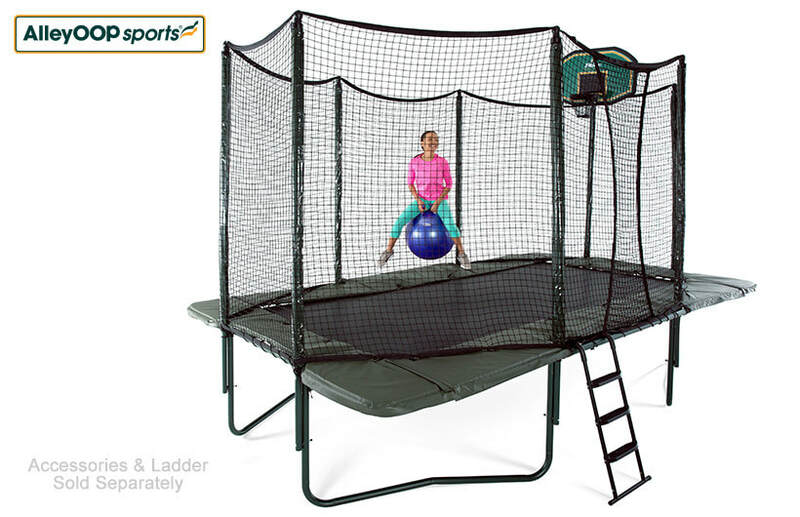 This is a good tumbling trampoline. The size is larger than most online rectangles, and fits well in narrow yards. 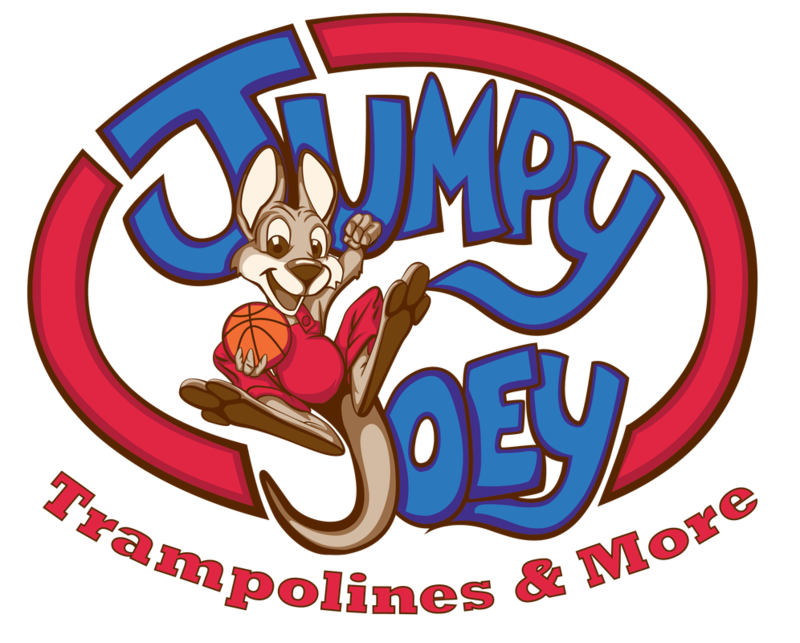 I'm a fan of the JumpSport Classic Trampolines. The design has worked for over a decade now. 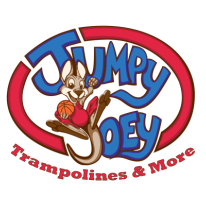 JumpSport actually makes the AlleyOOP Trampoline line as well. This traditional more classic design has a black powder coated frame, long bouncy springs, pole sleeves covering the foam, super tough net, always closed fail-safe doorway, and interior padding. This padding is not as thick as AlleyOOP padding, and the frame is thinner as well, but overall a wonderful mid-grade trampoline that will last a really long time. Fair warning, the enclosure is tough, but also extremely tough to assemble it properly. We have saved many homeowners a lot of time by assembling these for them. There is also a PowerBounce (extra layer of springs) version of this unit. 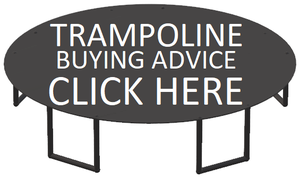 This is the most popular round trampoline made by AlleyOOP. 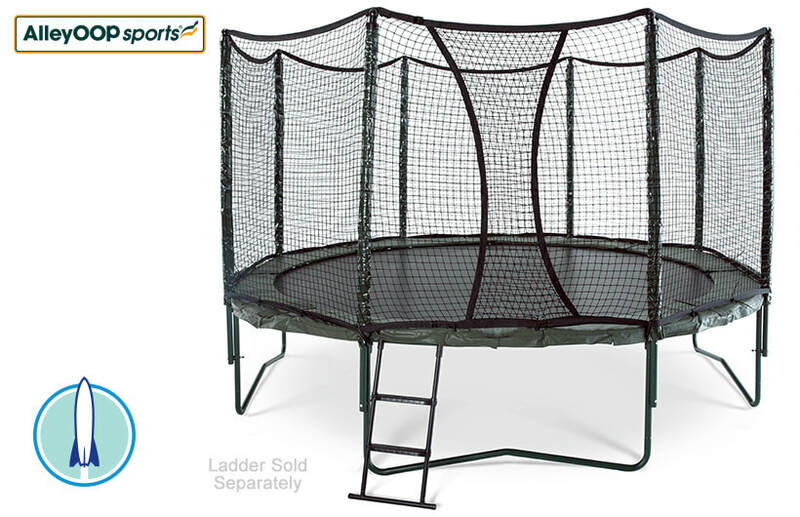 This is a high quality round trampoline with a description similar to the rectangle model above. Once again green frame with green padding matches any landscape. Same tough enclosure system and netting is found on all AlleyOOP units. The 14' round space is completely usable as the netting goes outside of the frame. These are heavy gauge units with open weave nets that allow the wind to travel through, making it less likely to take off in a storm. The bounce on these units is remarkable and all kids that get an AlleyOOP only have great things to say about the. AlleyOOP makes a PowerBounce option (extra layer of springs) for this trampoline as well in both the 12' and 14' round units. Magic Cage is a wonderful brand of trampolines. These go together very well and boast an amazing max weight capacity. An octagon is a unique shape, and it's basically 4 rectangles overlaid atop one another. This netting is sewn on to the jumping surface, ensuring a kid cannot pass through. The doorway is "always closed" to prevent doorway injuries. These are definitely bouncy trampolines made to last. The assembly is rather quick for these units. 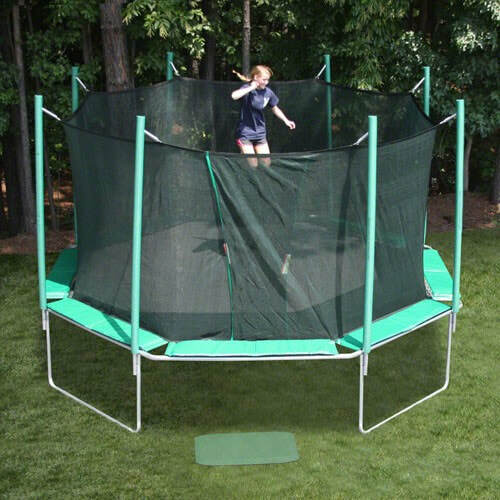 Magic Cage also makes this trampoline available without an enclosure as well. This is the King Kong of round trampolines. This is the trampoline I personally have in my backyard. This is an extremely well made trampoline. All the best components are in use here. There are 2 jumping surfaces separated by about 8" of air cushion between them. This trampoline is very bouncy, and preferred by many YouTube trampoline enthusiasts! Recommended for active kids and teens. You will not find another trampoline like it, as it's very unique and patented. This trampoline excels on all trampoline safety tests. There is also a DoubleBounce PowerBounce option (2 jumping mats, extra layer of springs also) also available. AlleyOOP stands for quality at every corner. This is a massive rectangle trampoline and extremely bouncy. The green powder coated frame, and green padding look really nice in any yard. The springs are long and bouncy, and the enclosure system is second to none. The netting is very sturdy and overlaps at the doorway eliminating a zippered net that kids forget to close. The netting also goes outside of the frame allowing the kids to utilize the padding as a resting space and really opening up the total usable space rather than causing a claustrophobic effect. If you have kids that watch YouTube, they've definitely heard of this trampoline. There is also a PowerBounce (extra layer of springs) version of this unit as well. Springfree is a brand I'm often asked about. They spend a great amount of money on marketing, and really get their name out there to the consumers. I'm not fully onboard with Springfree units being worth their costs. These are expensive trampolines to simply have gotten rid of the springs out of the equation. They claim the springs cause the accidents, and I don't agree with that. Horse play and carelessness causes accidents. Keep in mind, most trampolines have the net go to where the jumping surface ends, eliminating contact with springs anyways. Getting past the marketing of these units, they are good quality materials being used. 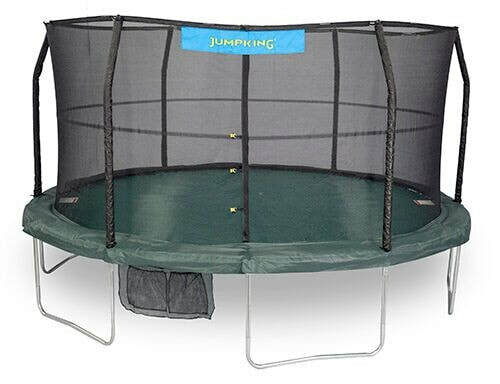 I don't feel as though these are as bouncy as good high end traditional trampolines, and you're also short changed on the bouncing space, as the net concaves inside (like an hour glass shape) eliminating the ability to comfortably jump on the edges. Once more than one child is inside of these units, they're always bouncing into one another without a resting spot. The manufacturer will warn against multiple kids at a time, and while that's a great idea, it almost always is a rule that gets broken once comfort sets in.